Having the gym this close leaves you pretty much excuseless. Knock it out early so you have more time for the beach. Kids need a nap? Curl up with a book or finish that movie you started on the plane. Drifting around on a raft has that glorious effect on you. Don't feel even slightly guilty - vacations were meant for indulging a bit. Join fellow guests all gazing out over the water to see the spectacular show the sky puts on each night. So close to the beach, shoes are purely optional. Kids'll feel like VIPs here, with an action-packed children's club schedule and dedicated pool. The poolside bar doubles as the resort's most popular sunset-viewing spot. The lively El Malecon Boardwalk is a well-worth-it 14 minute drive away. A butler standing by eager to cater to your every whim sets the “pinch-me-I’m-dreaming” tone at the exquisite Sunset Plaza Beach Resort & Spa. Infinity edge pool and ocean view suites roll with the theme, leaving you wishing you could stay another week (or three). Your spacious vacation residence spoils you with marble bathrooms and an in-room jetted tub, plus a pillow menu, robes and slippers. Book a half-day at the spa and decide instantly you could get used to this. Hit the Technogym Fitness Center or tennis courts bright and early, so you can lounge surfside the rest of the day guilt-free. Debate dinner options (Italian or the bistro/grill) while sipping cocktails and watching the spectacular sunset from the Aqua Bar. When you’re ready to venture beyond the pool and beach, the historic downtown awaits, complete with art galleries and restaurants galore. 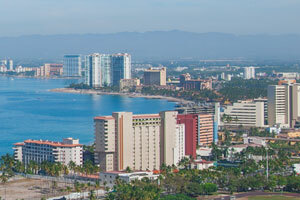 Don’t miss the incredible oceanfront promenade, dotted with vendors and street performers, and rich with local flavor. Developed in the late 1970s, this area is home to several resorts, malls, restaurants and an active nightlife. Check out Plaza Galerias for shopping, a gym, a movie theater and even a casino! There are also four beaches in the Hotel Zone.